A new user interface for topics within content strategy that lists your content in a table view. This layout helped you visualize the concept of content strategy, but didn't let you easily scan or compare the content attached within it. 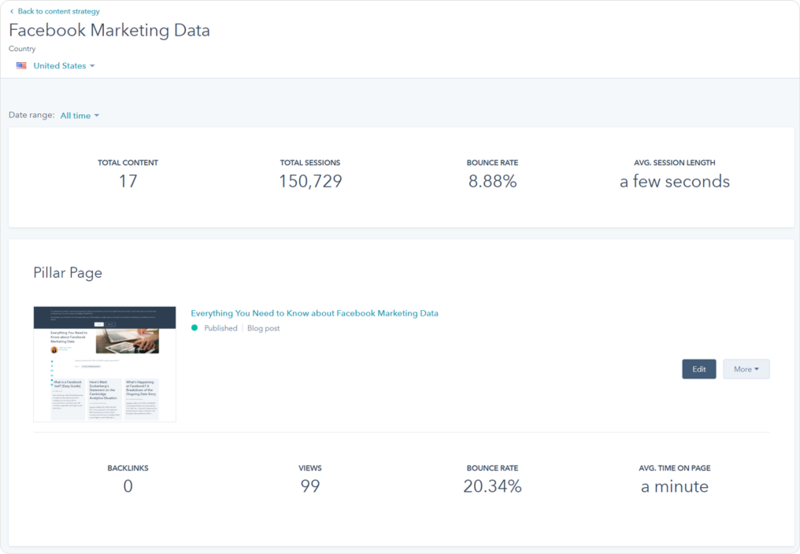 This new layout for topics is more consistent with the other tools in HubSpot, is able to show you more pieces of subtopic content, and implements reporting elements that show you how your content is contributing to the topic. In the Content Strategy tool, when a user clicks on a topic they will be prompted to opt-in to the new user interface. In this new interface, you will be able to first see high level metrics such as the number of content pieces for the topic, the total sessions, etc. Next, you will see the pillar page for that specific topic. You’ll be able to edit the pillar page, and also analyze the page’s performance. Scrolling down the page, instead of the “spider web” of supporting content, you’ll now see all your supporting content listed in a table. In this table, you’ll see the same metrics available for the pillar page above. You’ll also see whether or not your subtopic content is linked to the pillar page, and you can click the “Not Linked” message to re-check whether or not the page is linked. This update is now available for opt-in to a small group of users. All Marketing Hub Basic, Professional, and Enterprise users will be able to opt in over the next few weeks.